IAU circular No. 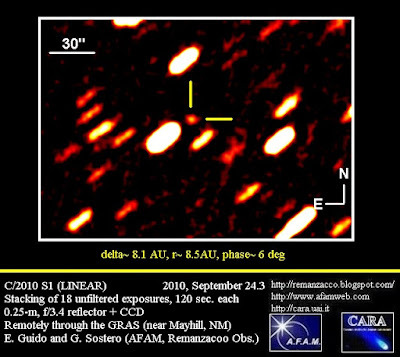 9170, issued on September 24, 2010, announces the discovery by the LINEAR survey of an apparently asteroidal object found to show cometary appearance by other CCD astrometrists. The discovery observation was obtained by LINEAR on Sept. 21.3 UT with a 1.0-m f/2.15 reflector + CCD. 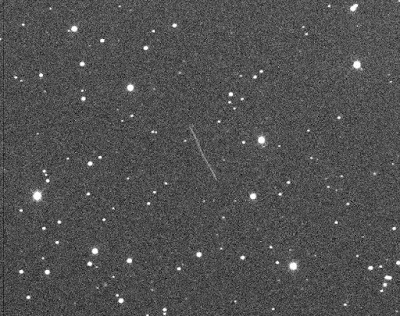 After posting on the Minor Planet Center's NEOCP webpage, some observers have commented on the cometary appearance of this 18 magnitude object, designated C/2010 S1 (LINEAR). We have been able to confirm this object remotely, through the GRAS network, using a scope located in Mayhill (NM): 0.25-m, f/3.4 reflector + CCD. : on Sept. 24.3, co-adding of 18 unfiltered exposures, 120-seconds each, show that this object appears soft compared to nearby field stars of similar brightness with a slight elongation in the east-west direction. The preliminary orbit for comet C/2010 S1 (LINEAR) shows perihelion on May 09, 2013, at about 4.4 AU. According to COCD website, this is the 199th comet discovery for LINEAR. IAU circular No. 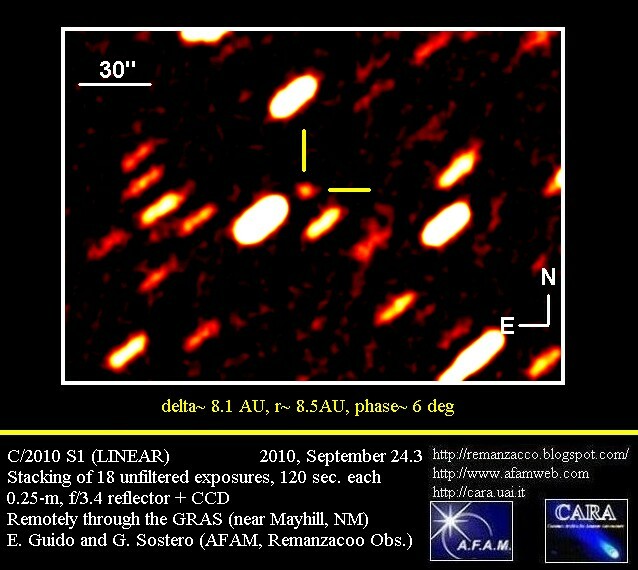 9169, issued on September 20, 2010, announces the discovery by La Sagra Sky Survey (LSSS) of a new comet on Sept. 14.9 UT with a 0.45-m f/2.8 reflector. 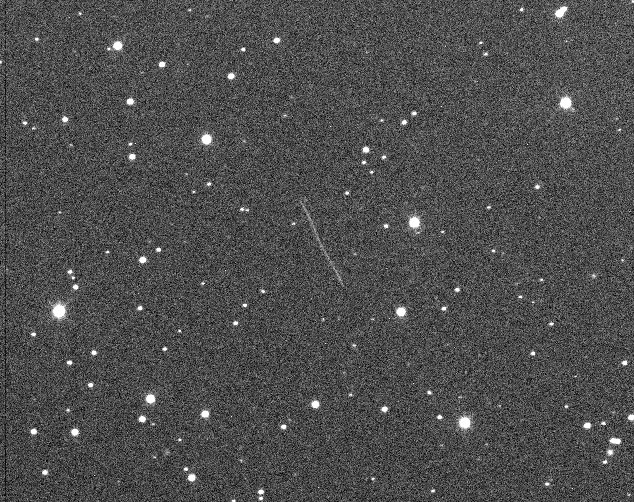 After posting on the Minor Planet Center's NEOCP webpage, some observers have commented on the cometary appearance of this 18.4 magnitude object, designated P/2010 R2 (LA SAGRA). We have been able to confirm this object remotely, using a 0.15-m f/7.3 refractor at the Tzec Maun Observatory (near Moorook, Australia): on Sept. 17.6, co-adding of 12 unfiltered exposures, 300-seconds each, show a condensed coma nearly 10-arcsec in diameter. According to the IAUC No. 9169 & the latest orbital elements on MPEC 2010-S28, this object appears to be another "main-belt comet", similar to 133P = (7968) Elst-Pizarro. This is the 4th discovery for the amateur survey La Sagra. Congratulation to the LSSS team members. The full discovery story has been posted on LSSS website. 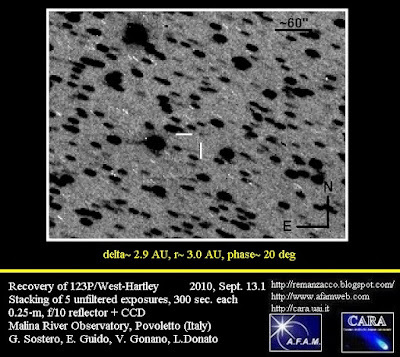 MPEC 2010-R111, issued 2010 Sept. 14, reports our recovery of comet 123P/West-Hartley. We found the comet on September 12, 2010 at magnitude 19.8. We imaged it from Malina River Observatory, Povoletto (B90) using a 0.25-m f/10 reflector + CCD. Please click on the image for a bigger version. Comet 123P/West-Hartley was last observed (before our recovery) on July 20, 2004 by Siding Spring Survey (E12). Two small asteroids (2010 RF12 & 2010 RX30) will pass within the Moon's distance of Earth today, September 08, 2010. 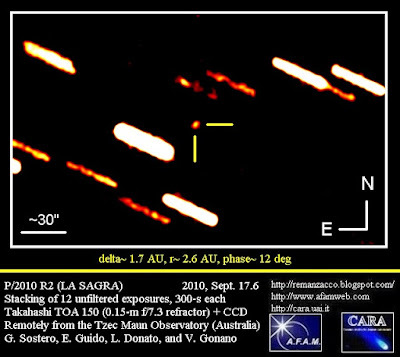 Both objects were discovered by the professional "Catalina Sky Survey" on September 05, 2010 with the 1.5-m telescope at Mount Lemmon in Arizona. According to Nasa JPL website, 2010 RX30 has a value of H=27.1 and is estimated to be 10 to 20 meters in size and will pass within 0.6 lunar distances of Earth (about 248,000 km) at 9:51 Greenwich standard time. While 2010 RF12 With an absolute magnitude of H=28.1 is estimated to be 6 to 14 meters in size will pass within 0.2 lunar distances (79,000 km) a few hours later at 21:12 Greenwich standard time. When we shoot our image this rock was speeding at about 31 deg/day, shining at about magnitude 15.